Dried oranges add flavor and color to cold drinks and teas. They spice up muffins, breads, salads and sauces and they also make a sweet, chewy snack. Drying oranges in a food dehydrator is a simple process, and dehydrating lets you buy in bulk at the height of the season when the fruit is fresh and ripe and the price low. 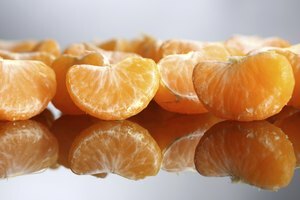 Dried oranges retain nearly all of their nutritional value and flavor. 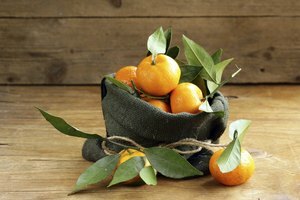 With a minimum amount of work, you can preserve enough fresh oranges to last an entire year. Set the food dehydrator at 120 to 130 degrees.Thoroughly wash several pounds of large oranges and dry them with a paper towel. Ten pounds of fresh oranges usually yields about one lb. of dried oranges. 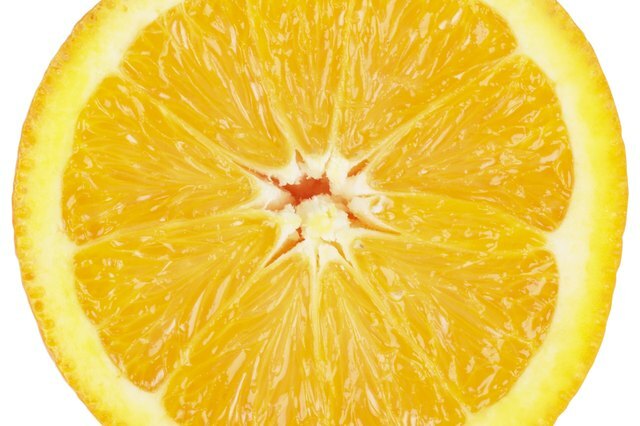 Place an orange on its side and slice off the top and bottom of the fruit. Cut the remainder of the orange into slices roughly 1/4-inch thick. Try to make the width uniform so that the drying time for the slices is the same. 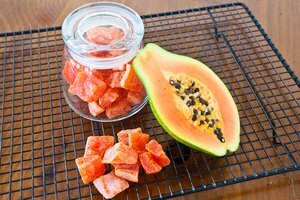 Lay the slices in a single layer on the food dehydrator trays and place them in your dehydrator. Depending on the dehydrator and the thickness of the cut, it can take 12 to 24 hours to dry the slices. Check the oranges every few hows and flip them over at least once. When oranges are fully dehydrated they will be transparent and brittle. Cut strips of orange rind from three or four oranges. Use a vegetable peeler or a sharp knife, and try to make your pieces about 1/8 of an inch thick. Remove as much of the white bitter-tasting pith as possible. Place the rinds in a single layer on the dehydrator tray. Check the rinds every few hours. As they dry, they will become harder and less flexible. Dried orange rinds can be cut and added to foods, or they can be ground up and used as a powered spice. Peel several oranges and break the orange into segments. Cut or break them in half and place the sections in a single layer on a dehydrator sheet. If the sections are especially thick they might need 24 hours or more to fully dehydrate. Chunky pieces of dried orange are good for snacks and can be mixed with chopped nuts, raisins and chocolate chips for a trail mix. Cool all dehydrated slices, rinds and pieces for about one hour. Place your orange slices in an airtight plastic storage bag. Also place your orange pieces and rinds in a plastic storage bag and let them sit for five or six days. Oranges that still have moisture will create condensation inside the bag, or will sometimes clump together. If that happens, put your pieces or slices back into your food dehydrator for several more hours. 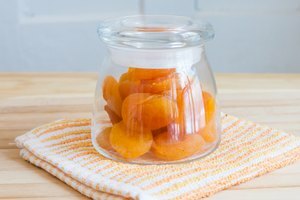 If your oranges pass the bag test, you can either store them as is, or transfer them to storage jars with an airtight seal. 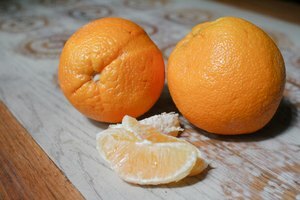 A food slicer can help make your orange slices a uniform width. It's not necessary, but it makes dehydrating oranges even easier. Dried orange slices dress up drinks and specials dishes and many people enjoy them as a snack. For a special dessert or treat, dip half of each slice in melted chocolate, cool and serve.